Biography of American Landscape Painter of the Hudson River School. 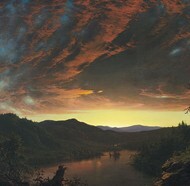 One of America's best landscape artists and the quintessential exponent of Romanticism, the American painter Frederic Edwin Church was an important member of the Hudson River School of landscape painting, a pupil and friend of Thomas Cole (1801-48), the movement's leader, and an important contributor to Luminism. In addition to capturing the physical and spiritual beauty of native American scenery, Church travelled extensively the length and breadth of the continent, depicting tropical forests, spectacular waterfalls, volcanoes and icebergs. At his peak during the mid-Victorian Age, he was one of the most famous modern artists in the United States, but tastes changed, and by the time he died he was largely forgotten. Famous works of American art by Church include: The Falls of Niagara (1857, Corcoran, Washington), The Heart of the Andes (1859, Metropolitan Museum New York), Twilight in the Wilderness (1860, Cleveland Museum of Art), and Cotopaxi (1862, Detroit Institute of Arts). One of the greatest dramatic landscape painters of 19th century modern art, his works are currently undergoing a revival, due to today's environmental concerns. Frederic Edwin Church was born in Hartford, Connecticut, to a respectable family whose wealth allowed him to devote all his time and attention to his drawing and oil painting. At the age of 18, after a family introduction, he became the pupil of the celebrated New England landscape painter, Thomas Cole, in Catskill, New York. Four years later, in 1848, Church was elected the youngest Associate Member of the National Academy of Design. In 1849, he was elected a full Academician and within 12 months sold his first major painting to the Wadsworth Atheneum in Hartford. Following the death of Thomas Cole, Church based himself in New York and quickly established a regular routine. In the Spring he would leave the city and travel the country, sometimes by foot, sketching the sights and scenery of his journey as he went. In late Autumn he would return to convert his sketches into paintings, in his studio, and endeavour to sell his work. Later, Church showed his landscape pictures alongside those by other members of the Hudson River School - like Thomas Cole, Albert Bierstadt, John F. Kensett, Asher Brown Durand, and Jasper Cropsey as well as other wilderness painters like George Caleb Bingham (1811-79) - typically at the annual exhibitions of the American Art Union, the National Academy of Design, and the Boston Art Club. During his early formative years as a full-time painter, Church's scenic panoramas (like A Country Home, 1854) followed in the tradition of Romantic Classicism, idealizing the wild primeval beauty of the Hudson River region, and celebrating the simple life of the backwoods, a lifestyle soon to be promoted by Henry Thoreau (1817-62) in his highly successful literary masterpiece Walden, Life in the Woods (1854). In his late 20s, Church started to look further afield. In 1853 he made the first of many sketching trips abroad, in search of even more dramatic landscapes. Over the next 20 years his wanderlust took him to every corner of South America, where he followed in the footsteps of the celebrated Victorian explorer Baron von Humbolt. He painted the tropical jungles of Brazil, the snow-covered mountains of the Andes, the volcanoes of Mexico and the icebergs of Labrador. In almost all his canvases, he expressed both the spiritual as well as the scenic grandeur of the natural wilderness, demonstrating his belief in the presence of God in the smallest feature of nature. His use of new, heavy metal colour pigments enabled him to produce sharp bright colours that gave his large scale works a huge impact on the viewer. One of his major works is The Heart of the Andes (1859), now in the permanent collection of New York's Metropolitan Museum of Art. Five feet in height and nearly ten feet in width, the painting was unveiled rather like a piece of live theatre in an auditorium. Exotic plants added to the atmosphere, while opera glasses were issued to enable the seated audience to examine the painting in detail. Not surprisingly, the work was exceptionally well received and sold for a massive $10,000 - a world record for a work of art by a living American artist. In 1860 Church married Isabel Carnes and purchased land and a farm in Hudson, New York. In 1861-2 he painted Cotopaxi (1862, Detroit Institute of Arts), one of the greatest modern paintings. By now he had become one of America's most famous painters, and his work was also known and admired in Europe. The English poet and painter Edward Lear (1812-88) called Church "the greatest landcape painter after William Turner." Alas, Church's first two children succumbed to diptheria in early 1865, although he and Isabel started a second family with whom they travelled to Europe and the Middle East in 1867-8. In 1867, Church purchased the 18-acre hilltop overlooking his farm, due to its spectacular views of the Hudson River and the Catskills. In 1870-72 he built a lavish Persian-style house on the land (called Olana), using many of his own architectural designs. Sadly, in 1877, Church was obliged to quit painting, due to the serious onset of arthritis in his hands. His Olana mansion and site is now a public museum and visitor centre, devoted to the artist, his paintings and travels. It attracts thousands of art and nature-lovers every year. In comparison, see the Tonalist landscape painting of George Inness. 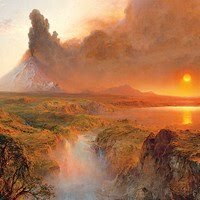 The largest collections of paintings by Thomas Cole, Frederic Edwin Church and other painters of the Hudson River School can be found at several of the best art museums in America, including: the Wadsworth Atheneum in Hartford, Connecticut. Other collections are in the Brooklyn Museum, the Metropolitan Museum of Art, the Newark Museum NJ, the New-York Historical Society, the Frances Lehman Loeb Art Center, the National Gallery of Art Washington DC, the Detroit Institute of Arts, and the Albany Institute of History & Art.